Over the past decade The Insiders have released music on some of the most respected labels in the drum & bass scene, including Renegade, Metalheadz, Creative Source, 31 Records, Defunked, Integral and Good Looking (as Catch 22). Regular support for their production comes from names like Fabio, Friction, LTJ Bukem, Goldie, Storm, A.I., Lynx, Hype and Marky. DJ appearances have included Miami WMC, Glastonbury Festival, Sun & Bass and Bristol Festival as well as dates throughout the world including the USA, Canada, Japan and Europe. The Insiders have been instrumental in pushing the deeper end of d&b in their Bristol hometown with their residency Intrigue, now in its tenth year. 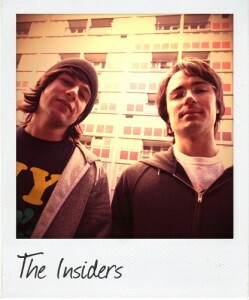 In 2009, one half of The Insiders Ben Soundscape launched Intrigue Music, an outlet for the soulful style of d&b they are known for. So far, the label has put out some fantastic tracks by Break, Random Movement, Survival, Superior Selectionz and the guys themselves. Their newest release is ‘The Rhythm EP’ (Intrigue009), a strong four tracker receiving support across the board from names like Friction, Random Movement, Storm and Skeptical. Other recent releases include ‘Limelight’ on Intrigue Music, ‘All the Way’ on Prestige and their remix of Flaco’s ‘Choose Me’ for Rubik. Forthcoming on Intrigue Music is their 12″ with Collette Warren ‘Wonder Why’, which will be backed with ‘Breathing Space’.